Despite the surgical technical evolution of open repair for thoracoabdominal aortic aneurysms (TAAA), this formidable surgical challenge is still associated with significant mortality and morbidity. In some high-risk patients, hybrid TAAA repair may allow a less-invasive approach. Usually a revascularization of visceral and renal arteries, via midline laparotomy, in a retrograde fashion from common iliac arteries is performed, and then the aneurysm is excluded with aortic endografting. This technique has the advantage of avoiding a two-cavity exposure, thoracic and suprarenal aortic cross-clamping and circulatory support, theoretically reducing visceral and spinal cord ischemia time. Despite a less-invasive approach, the technique still represents major surgery, and the results are variable among different centers. In larger studies, the 30-day mortality rate is reported between 8.6% and 15%, and perioperative 30-day morbidity such as spinal cord ischemia, renal failure, and mesenteric ischemia is reported to be around 9%, 15%, and 8%, respectively. 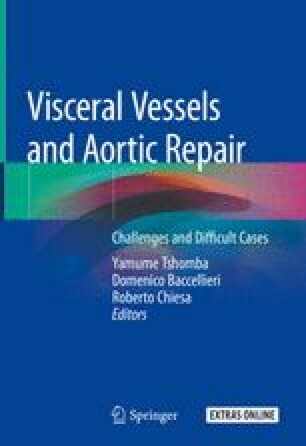 A staged approach to visceral vessels debranching and aortic endograft appears to yield better results. Hybrid TAAA repair is a good option for elderly and high-risk patients who are unfit for conventional open repair and when full endovascular repair is not feasible.